A damp but willing crew including old friends from afar put in a fantastic effort back in October to make the 14th annual Cider Weekend a success. We produced about 197 gallons of cider with just over 70% yield, and enjoyed great food and great company in the big barn on Saturday, despite a soaking rain. 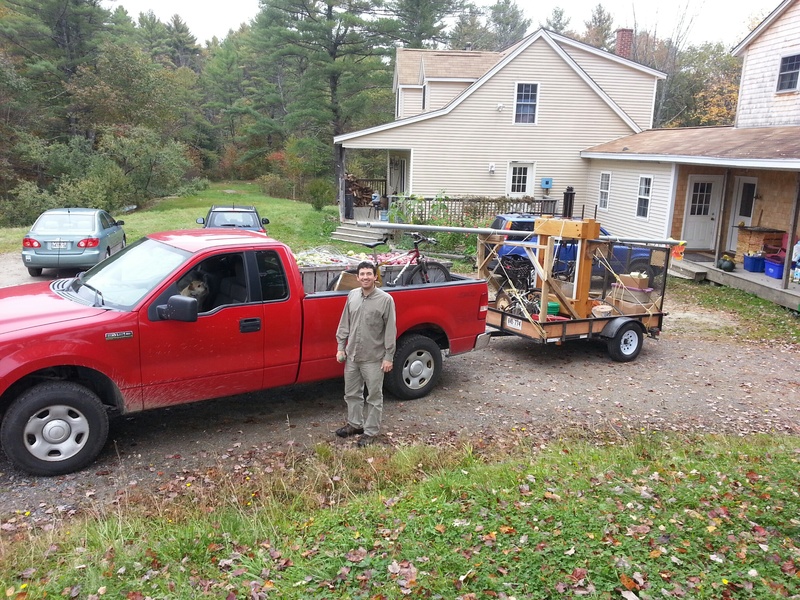 With other facets of life imposing, preparation for cider was largely on autopilot this year. 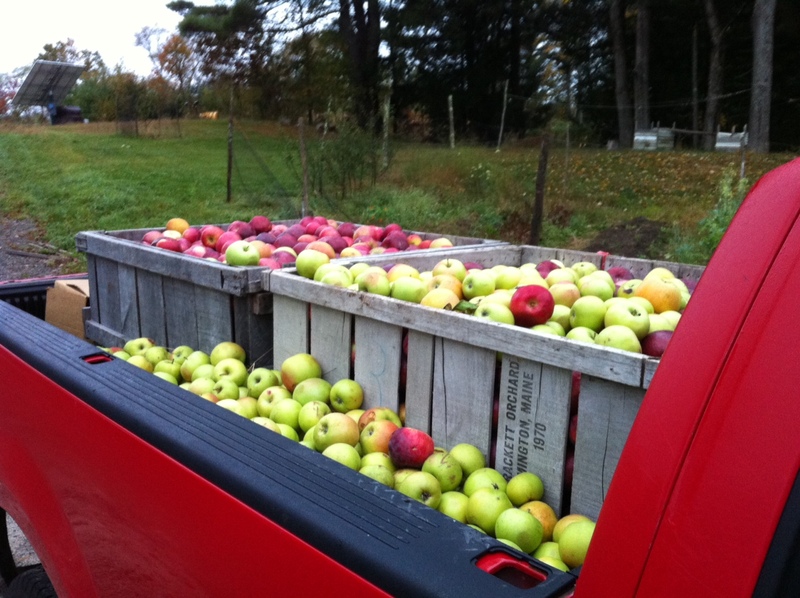 Holly arranged the delivery of two bins (about 1200lb) of mixed eating apples from Autumn Hills Orchard, packed in heavy-duty cardboard boxes that previously held ultra-pure silicon from his work. With the help of the amazingly intrepid Jim Serdy he also picked and shipped a few boxes of Golden Russet for the cider mix. 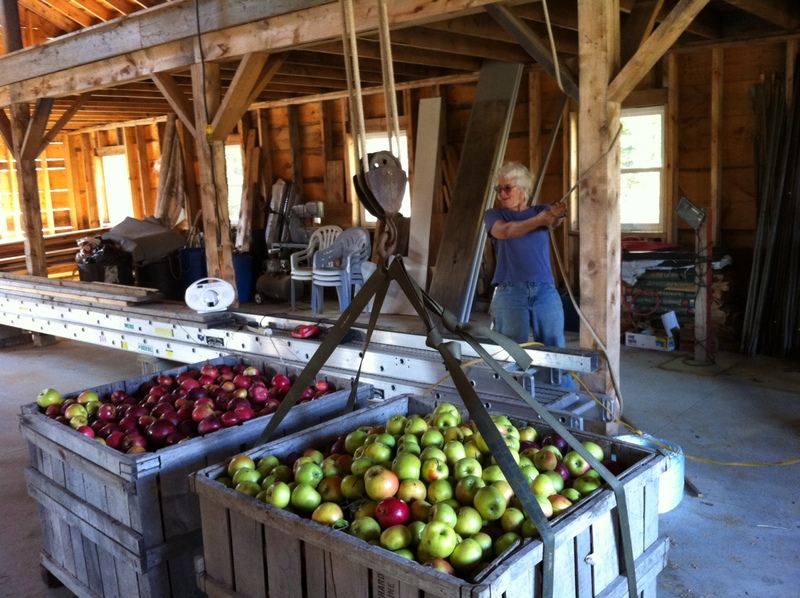 And I am ever grateful to Steve Wood and the crew at Poverty Lane Orchards and Farnum Hill Cider, who despite a crummy growing season came through with a bin of Dabinet bittersweet apples for the cider mix. We combined this with at least a bin of fruit my parents picked from the Five Islands orchard; however this was a shadow of the previous banner-year production. On the mechanical side, the one area of advancement this year was a pedal-powered chain drive apple conveyor, quickly assembled out of scrap wood and driven by the same bicycle that runs the tumble washer, that served to lift apples out of a receiving tank and deliver them into the washer drum. The idea was to avoid the laborious handling of individual apples into the washer, previously one of the more annoying tasks. With the new conveyor, clean apples can be dumped directly into the receiving tank without further attention, and the kids found the conveyor absolutely riveting. I’ve had the chain and sprockets for the project for years, and had been mulling over the design with the help of creative folks including Gene Kaufman. I finally put it together in a couple of evenings this fall. It consisted of a loop of 50-pitch chain with 12″ wide oak paddles mounted via special connecting links, running on a wooden frame with sliding facilitated by PEX water pipe. Meanwhile, Eerik and Holly were engaged in an intense effort to hook Eerik’s Erg (“Concept II” professional rowing machine) to the grinder. The rowing machine project had its origins in the observation last year that when the whole system was running smoothly, the grinder appeared to be the rate-limiting step. Eerik retains his love of rowing from his collegiate days, and dreamed of boosting the performance of the grinder with a rowing machine in parallel with the two bicycles. There were several complexities, including the large size and relatively low stature of the rowing machine, the fundamentally pulsating nature of its power flow, the fact that its chain-driven flywheel spins the opposite direction of a bicycle, and the mechanical details of its flywheel, which is surprisingly softly mounted and not designed to deliver power beyond the squirrel-cage fan riveted to it. Undaunted, it occurred to us that the hydraulic hoses on the pedal-powered cider press do an admirable job of physically decoupling the pedal powerstand (which also grinds grain) from the press, and inspired by the success of the press in general, I secured the necessary components from Surplus Center, and we contrived to couple a log-splitter pump to the flywheel, and deliver the power directly to the grinder using a small hydraulic motor. Holly and Eerik executed both sides of the erg-to-apple-grinder powertrain, and with great fanfare we charged the hydraulic loop and Eerik took an inaugural pull on the chain. Unfortunately, while we were able to spin the grinder with the Erg, the losses in the hydraulic system (seemingly primarily in the motor rather than the pump) were such that it was not able to contribute significantly, and we did not end up using it on Saturday. It appears that human-powered hydraulics are much better suited to high-force applications than high power applications, and in retrospect this is not too surprising. And realizing how simple the mechanical drive of the Erg is, we resolved next year to figure out how to mechanically couple it to the press and realize Eerik’s long-cherished dream of grinding apples by rowing power. Keith Richtman contributed his considerable knowledge of bike hacking all around, including the surprisingly effective technique of using a piece of PEX tube to guide and deliver the slack side of a chain drive directly to the sprocket, avoiding the need for a more precise and sensitive contrivance. All that being accomplished or not, we reconvened Saturday morning to enjoy Kelsey’s delicious breakfast burritos, and set to work grinding and pressing apples. As usual we got rolling between 9 and 10AM, and work proceeded with minimal mechanical issues. A steady rain that started mid-morning limited the typical influx of day-trippers to the most hardy and dedicated souls, but the large population of overnighters carried the day – at most we had probably 50-60 people, who fit pretty comfortably in the barn, whereas recently on a sunny Cider Saturday we probably have close to 100 – the event seems to be nicely self-regulating in that way, so long as there isn’t too much fruit to process. Still, the cold and rain this year suggests that we work to move the event closer to the middle of October than the end. The pressing process was streamlined by the addition of specialized press cloth squares purchased by Holly from a cider supply company, which both flowed more freely and seemed much more tear-resistant than the muslin we’d used over the previous thirteen years. Instead of depositing pomace directly into the loader bucket of a tractor outside the window, we used a large reclaimed plastic bin outside the window, which limited the tractor trips to the compost pile that were needed in the rain. After dinner, folks with young kids retired to the cabins early, while others sat up talking by the fire in the red barn. The major remaining annoyance of the process is the manual cutting out of bad spots; this mostly applies to the wild and home-grown apples which are not sprayed as assiduously as the professionally-grown apples. Last year I did pretty well on the organic spray routine with Surround, BT, etc., but with a lighter fruit set and frequent rain I didn’t stay on top of the pests as much as I could have. We’ll see how I do next year, given everything else that will be going on. Agricultural nozzles from Tractor Supply replaced the finicky improvised garden hose sprayer in the apple washer; Joshua and Gene recommended a more thoughtful arrangement of these nozzles to better rinse the apples after the emerge from the tumbler. The large cast iron frying pan remains a key piece of equipment, but it could use some kind of diffuser to spread the heat more evenly – a valuable junk-scrounging/minor welding project. 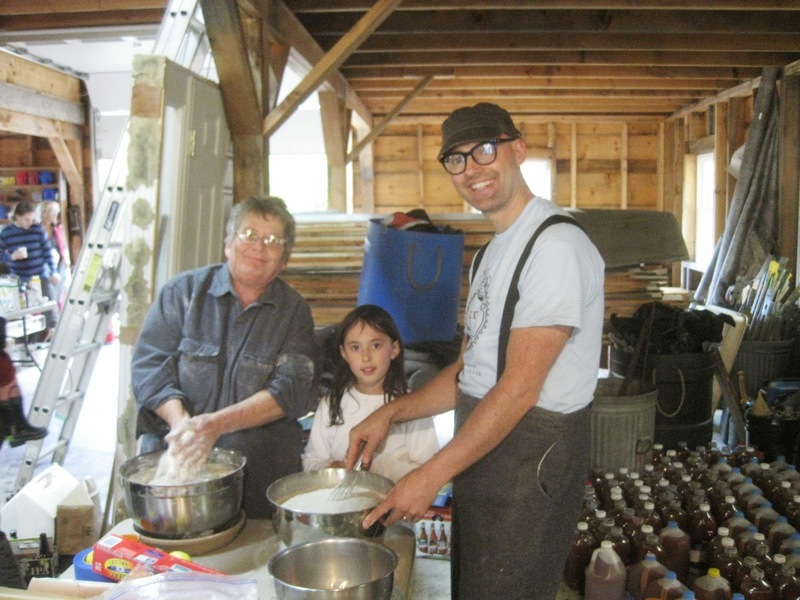 The biggest difference next year will by that my folks have built a new maple syrup/cider barn between the house and the current barn, so they can kick the pesky cider operation out and finally bring in the livestock that was its original purpose. The new barn is not quite as large overall, but it will have a larger open space, and also a large wood-burning firebox that could even be used for boiled cider. There are other exciting changes in the works as well – always so much to look forward to! Thanks to Holly and Eerik for photos, and to everyone, near and far, who continue to make this tradition so much fun. Happy New Year, and much love to all! 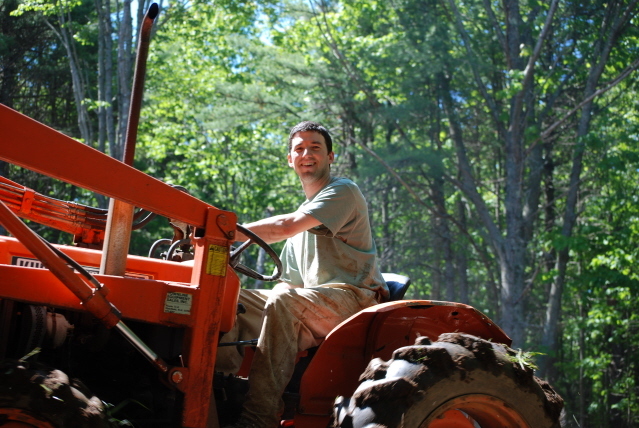 Last weekend we gathered with friends and family for the thirteenth year running to make cider using bicycle-powered equipment, and for the first time, the majority of the apples came from our orchard – a major milestone in a project that began in 2006, with the first trees planted out in the orchard in the spring of 2008. It’s been a long time coming, and in the years since the Cider weekend has evolved and grown significantly. The weather was amazing, sunny and mild, and we had a good crew to help. 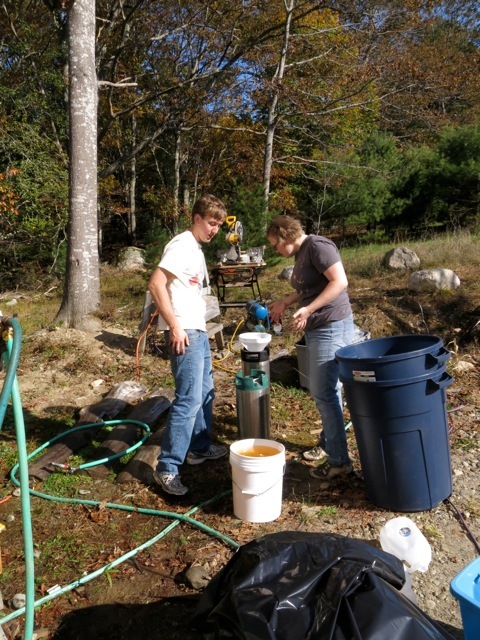 In total we pressed 275 gallons on Saturday, with a yield of approximately 69%. 100 gallons went into glass between our root cellar and Holly’s basement, and the balance went into freezers and refrigerators across New England and beyond. The equipment behaved fairly well, and we also made significant advances in both growing and processing grain. Friday night we gathered as usual by the cove for a picnic and campfire, then Alexis, Holly, Steven, Eerik, and I worked for a few hours in the barn on last-minute details. By prior arrangement Eerik brought some linear guide assemblies made from rollerblade parts and T-slot extrusion to significantly improve the action of the dual counterpressure bottle-filling apparatus, and while he was assembling it I improvised a foot-pedal-operated mechanism out of scrap wood. Previously the filling head assembly was supported on janky linear guides made from copper pipe with wooden bearings, and a hand-operated screw was needed to clamp the head in position so the pressure of the CO2 wouldn’t blow it out of the bottle in a volcano of carbonated cider. Now the filling heads moved smoothly up and down, and a heavy counterweight reacted the pressure until it was released by stepping on the pedal, and it all worked brilliantly. We contemplated how it could be further improved by automation driven by bicycle-compressed air; we’ll see if we get anywhere with that next year. Meanwhile, Holly fit an antique cast-iron corn sheller to the bike-powered stand that also ran the cider press and the high-quality grain mill we added last year. As usual he did an amazing job of cleaning up and restoring the cast iron, and he fit a crummy aluminum pulley to the shaft by manually matching the square taper of the handle. The sheller worked amazingly well on the wheelbarrow-load of corn we had previously harvested from the patch of newground by the Upper Cabin. It has an amazingly clever and hilarious mechanism whereby the spent cob is ejected upward diagonally so that it doesn’t fall into the bin of shelled grain. The only issue was that kernels went everywhere; we solved that problem by sacrificing a plastic storage bin to confine the flying grain. With the equipment in good order, we turned in, returning at dawn to get things spun up. No matter the preparation, it always seems to take a couple of hours to get everything ready to go (and a pause for Kelsey and Beth’s delicious breakfast burritos), but by shortly after nine we were in operation. As usual, the first stage of the process is washing the apples; we resurrected the pedal-powered, astroturf-lined rotary wash drum from last year, with the addition of a couple of finely-balanced soft-bristle brushes that may or may not have actually made much difference. The crew sorted apples on the way into the drum washer, composting the bad apples and cutting out bad spots; this attention to detail is probably a big part of why our cider tastes so good. Tubs of washed apples were hand-carried to the grinder, where two folks pedaled while one more fed apples in, two at a time, and a fourth forced them into the grinding drum with a wooden plunger. With vigorous pedaling the chains and forks popped off now and then; a more rigid assembly with less wood in the compressive path would probably eliminate these issues, but in any case the freewheels on the driveshaft prevented injury or damage. I did get the sense that when the process was running smoothly, the grinder did seem to be the bottleneck, indicating that a third pedaler might be in order (or perhaps Eerik will come through with a rowing machine as promised for next year). From the grinder, tubs of fine, soupy pulp were carried or dragged to the other side of the barn, where they were baled into cloth-lined forms, folded into cheeses, and fed into the pedal-hydraulic press. Holly did buy new press-cloth this year, but it seemed to be too impermeable, leading the stack of cheeses to get squirrelly, to the point where some of the wooden grates suffered damage. He says it’s the same stuff per the internet fabric site where he ordered it; next year we will need to try some different fabric. In any case, we reverted to the old cloths, and the press settled down to its work. All the while, the same hacked Schwinn exercise bike that ran the hydraulic pump was also grinding corn and rye (both grown in the orchard this year) for dinner; it was relatively simple to pulse the valve on the hydraulic pump to get the desired flowrate of cider while pedaling steadily for the grain grinder. All in all the new multipurpose pedal hydraulic stand we built was a great success. Increasingly in recent years the overnight crew has been reinforced during the day on Saturday by a surge of day-trippers, including lots of locals, family friends, and this year a delegation from the Rand family. Many hands make light work, and despite a leisurely lunchbreak (complete with Nebraska Cream Can Dinner) and a near record supply of apples, we were done in time for dinner; we hoisted the gear into the loft of the barn, set up tables and benches, and served Holly and Becky’s amazing feast of chili, cornbread, and apple crisp, baked in the barn using a used electric range secured from Craigslist. We also had a temporary sink with hot running water from a Craigslist hot water heater, and even an improvised outdoor shower so folks could rinse off the sticky apple mist. Folks with kids retired to various cabins and tents after dinner; others hung out by the fire in the mild evening. Sunday morning another beautiful day; pancakes, homefries from Stroudwater garden potatoes; more cleanup as well as orchard tours, and playing by/on the cove. Ela even conspired to get Holly and me to break out our fiddles and play in the sun, a reminder of times when somehow there seemed to be time for music. Leftover lunch, and goodbyes capped a fantastic year, with great people, great food, and delicious cider. Thanks to everyone who pitched in, and thanks to Eerik and Terran for the photos in this post. Here’s a link to Eerik’s photos: https://photos.app.goo.gl/P75i6RIaVTHwCzbt1 if you have others in a world-readable place, please put a link in a comment – thanks again! I managed to get up to Five Islands the weekend before the big event, and with Dave’s help I got the equipment down from the loft of the barn, hooked it up, and got the basic functionality tested. Already by then he had dozens of buckets full of apples from around the property and around the island – at least a bin’s worth (about 600lb). The gear came together smoothly, and I attribute this to our liberal use in recent years of ‘Fluid Film’ aerosol lubricant, a WD-40-like product that goes on with a satisfying fizz of bubbles and leaves a cosmoline-like film on everything to prevent rust. 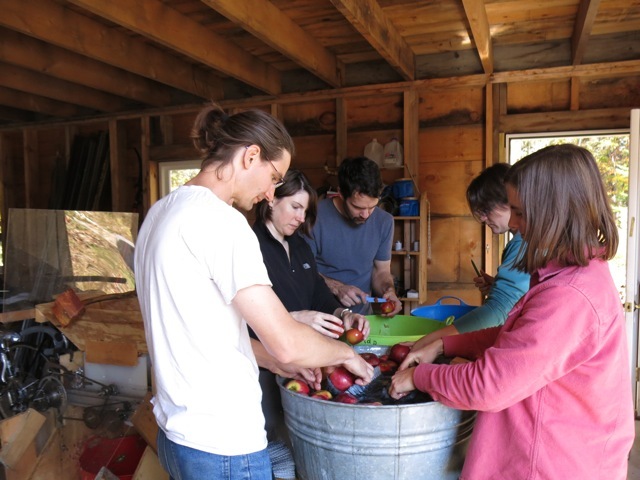 The big event started early afternoon Friday when I arrived with a truckload of apples and a trailer of random gear; I cleaned and provisioned the cabins, set up the water system, and organized apples. 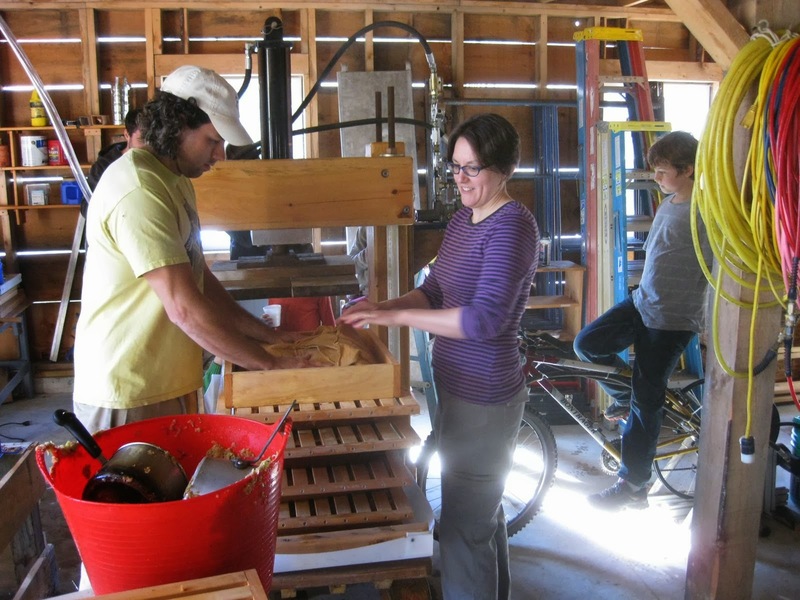 Holly and Becky, Holly’s mom, and the kids arrived well before dark and set up camp in the lower cabin, then he, Dave, and Ben Wilkins worked to assemble the latest addition to the pedal equipment collection, a cast aluminum hand-cranked grain mill adapted for pedal power. Holly and I had coordinated beforehand, and we had pulleys, 5/8″ shaft and pillowblocks, bike chain, and adapters that go from shaft to the fine-pitch thread that accepts a bike freewheel. With these parts they soon had the rig set up and working smoothly. A cold front had come through and a cold wind was blowing straight off the water, so we elected not to do dinner at the shore, but rather serve out of the barn, and we refried a big bucket of black beans and folks made burritos followed by Emily’s chocolate chip cookies and smores around a campfire. In the morning we ate delicious baked goods and breakfast wraps provided by the Kaufman/Wilkins/Kneen clan, then we got to work. We set up the usual wash station to clean the apples going into the process, but many of the feral apples in the mix were really small, so for expedience we set up a parallel processing step to clean them using a pressure washer. Even the ones that got pressure washed got individually inspected and bad spots cut out – I think this attention to detail is an important part of why the cider ends up tasting so good. The grinder worked smoothly all day with the exception of the chain coming off the starboard bike once, and the derailleur on that same bike lost a sprocket once, but we were able to pilfer the missing part from another derailleur and get back online within a couple of minutes. The press ran smoothly, thanks in part to new press cloths that were properly cut to size and thick enough to do the job (mostly) with a single layer. Now that Holly has discovered the joy of sewing pants from used press cloth, we are going to cycle new canvas and muslin through the process each year to keep him and his family in trousers, since he refuses to buy pants. All through the weekend he was wearing the first pair he made, which look awesome, and the construction process is detailed on his blog. Meanwhile we set up the carbonation and bottling system, washed 750ml glass bottles, and set to work bottling the 2014 vintage. We ended up bottling 7.5 tanks of cider; there was half a tank left over when the capper broke just before dinner, so we left the remaining cider in the root cellar. The bottling rig could definitely use some streamlining; the janky linear guides I made out of copper pipe and scrap mahogany don’t work that smoothly, and a foot-actuated spring- or gravity-balanced system using 80-20 linear guides could make a big difference. And the failure of the capper was a wake-up call; now that we are processing this much cider it makes sense to keep some redundant equipment around. My folks made up the usual Nebraska Cream Can Dinner for lunch, along with random tasty food that folks brought. We paused the process briefly to eat, then got back to grinding and pressing. We filled the 100 gallon bulk tank with sweet cider, washed and filled plastic jugs, then started on the hard cider mix, using a combination of Dabinet, Bramtot, Wickson, etc. from Povlane, mixed sweets from Autumn Hills, and a wide variety of feral apples. We filled the tank again with hard cider mix, filled all the carboys from it, and still the cider kept flowing – and more people kept showing up with more apples. By the end we were searching everywhere for clean jugs, and even resorted to using a few of the 2.5 gallon jugs that my folks use to collect maple sap. Holly brought some whole kernel corn and wheat to grind for cornbread for dinner, and it went through the grinder fine in two passes (even though we didn’t have the special large-grains auger for the mill). 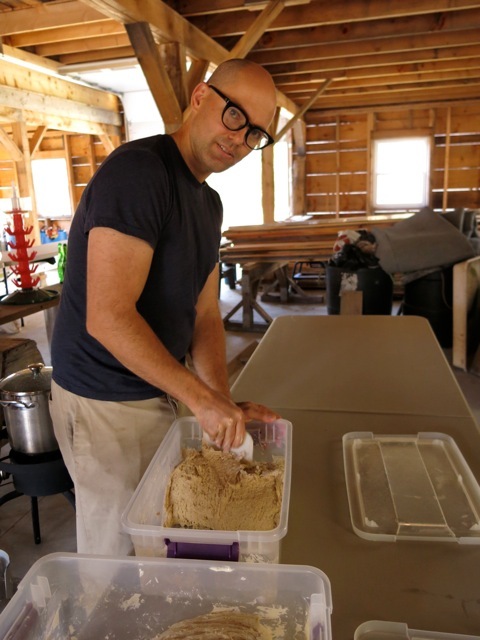 In the afternoon we experimented with grinding the buckwheat that we grew this summer between two rows of trees in the orchard. We succeeded in winnowing and sifting the grain, but it still had thin black hulls on the groats. After some experimentation we determined that we could grind the grain extremely coarsely, which would crack off most of the hulls while leaving the groats mostly intact. We then winnowed a couple of times using a box fan, which drove off most of the hulls, then we ground finer and passed through a mesh strainer which pulled out still more hulls. Finally we ran the material through with the grinding plates quite close together, yielding a satisfyingly fine flour. There was still a fair amount of dark hull material in the flour, but we figured this would be good for our digestion. Later someone looked online and read that the trick is to size the grain using a series of graduated sieves, then crack the hulls off each size of grain separately, so as to get more of them off without breaking up the grain too fine. If we grow buckwheat again next year maybe we’ll get some better sieves, instead of just using the hardware-cloth versions I made for this year. Dinner was served just as we finished the last of the pressing, and it was delicious as we have come to expect, with chili, cornbread, and apple crisp made entirely with apples from the orchard. Then more sitting around the campfire, and more cleanup as light rain was predicted in the morning. All day and all evening the ragtag tribe of kids ran around with spears and bicycles; Bodhi faceplanted at one point and banged up his face a little, but it’s a miracle there wasn’t more carnage. We got most of the equipment put away and a rough squeegee-ing of the floor, then folks retired to the cabins. Saturday night was warmer, and a light drizzle set in around breakfast time. We made pancakes with 100% Five Islands buckwheat flour topped with Five Islands maple syrup, and some had Five Islands blueberries as well. Plus home-fried potatoes, scrambled eggs, etc. We did some more cleanup, including breaking down the water system and pressure-washing the barn, then said goodbye to most of the crew who headed home mid-morning. 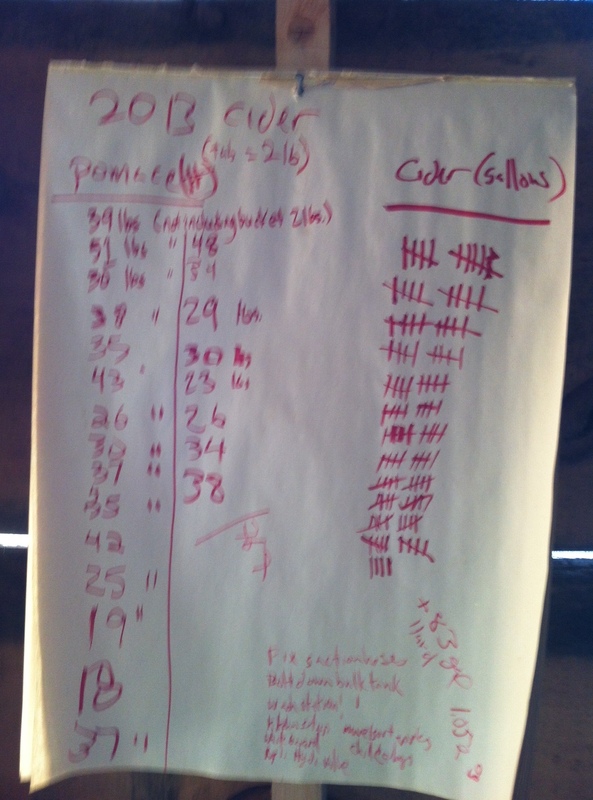 We transferred 9 carboys of cider to the root cellar, sulfited, and set 2 gallons of starter going to pitch on Monday. 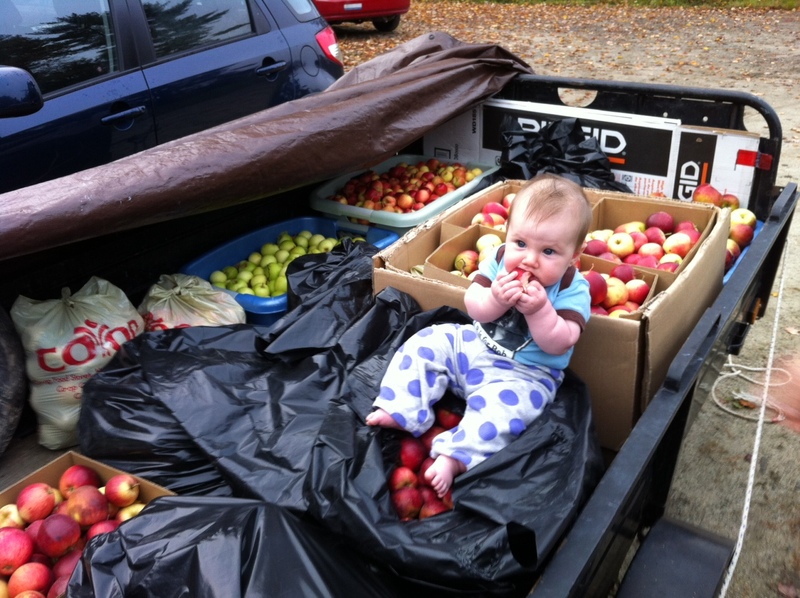 Holly and family stayed through leftovers for lunch, then got on the road in a zipcar minivan heavily-laden with cider. To see Holly’s report and more photos on this year’s cider adventure, check out http://tooling-up.blogspot.com/2014/11/cider-10-ten-years-of-pedaling-malus.html – and I highly recommend perusing his blog for reports on his various other adventures. Last weekend marked the 10th successive year when Alexis and I have made cider with Holly, Becky, and a steadily growing crew of enthusiastic friends. I am amazed by how this tradition has taken root, and how ever-increasing quantities of cider are produced and just as rapidly disappear. Below you will find the annual report; thanks to everyone who sent photos; please send more if you have them, and I’ll link to other peoples’ blog posts if they make them. Late in the week the weather was cranky, so I borrowed a friend’s box trailer, which was very handy for hauling the large number of cardboard boxes of glass bottles and open tubs of miscellany which always accumulate before cider. Between that and two bins of apples I was heavily laden for the trip to Five Islands. The craftsmanship looks really nice. 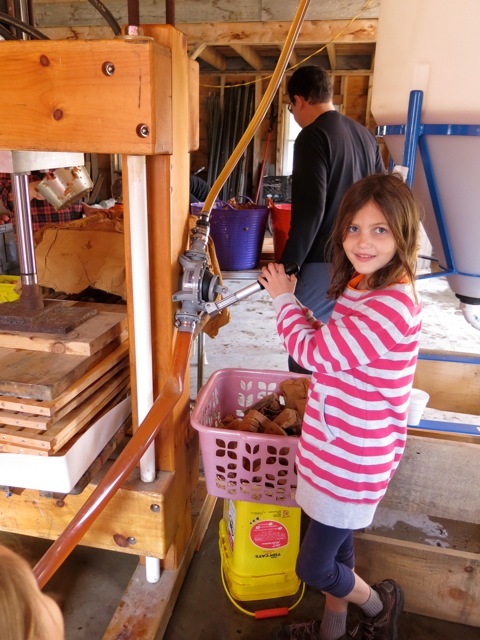 They use a small wood chipper coupled to a bike to grind the apples, and a pedal-hydraulic press made from a log splitter to do the pressing. Then they feed the pomace to some cows. The chipper is a neat idea, though the grind looks a little coarse (similar to our first-year results with the antique cast iron press). I bet it could be modified to make a finer grind by grinding down the cutters and then tightening up the gap. But, given that a lot of apple grinding equipment (including ours) isn’t self-feeding, he may be on to something with the wood chipper concept, and I can see how fabricating a flat disk and mounting cutters to it could be a lot simpler than the multi-step machining process we used to make our cutter drum. The press is made out of thick hard maple recovered from a bowling alley – major style points for that. Unlike our press, they count on the wooden uprights to take the full tension of the press; it looks like they use a smaller cylinder (maybe 2.5″?) so the load will be less, but they still get good pressure by using a smaller cheese. In watching the video it’s not clear why they need their cheese frame, since they aren’t really packing the cheeses full. We have some instability in our cheeses that sometimes requires re-stacking the press; I wonder if we could do better by cutting the cheese frame down to 3″ from 3.5″ thick. Alternatively we could make some shims that enforce a certain minimum cheese thickness until the stack is down to ~1/2 thickness; by that point the viscosity of the pulp will be much higher, and I’d think the stack would be less squirrelly. Anyway, hats off to Steve for joining the ranks of pedal-cider enthusiasts! Reuben asked in a comment about how I pitch yeast, and since the process has never failed us I thought I’d make a post of it. Usually I add 1/2tsp of potassium metabisulfite to each 5-7 gal carboy the morning after we press (I think sometimes I do it in the evening). This year we actually added it to the carboys ahead of time, so the rush of cider from the bulk tank did a good job of mixing it in. That starts the clock, and I aim to pitch between 24 and 36 hours after sulfiting. I am not at all an expert on sulfite, and would appreciate a link to detailed info on what the chemistry is, how long it is active, etc. We lug the jugs down to the root cellar (which is probably in the fifties or low sixties that time of year) and that’s where they stay. Anyway, our goal is usually to pitch on 5-6 carboys. I mix a half-gallon of sugar solution with 5-7% potential alcohol in a stainless pot. I used to use dextrose, but then I ran out, so I’ve been using plain cane sugar ever since. I throw in a few crumbs of nutrient, probably around 1/4 tsp. (I’m also not an expert on yeast nutrient, but again, I stick with what’s worked.) I let it boil briefly, then cover and let it cool. Meanwhile I’ve sanitized a 1 gallon glass jug and a funnel, and when the sugar water is lukewarm I pour it in the jug and pitch 1 packet of Red Star Pasteur Champagne yeast (the packet is yellow, not red). I shake it gently to dissolve, then let it sit until it starts ticking (in a few hours). Meanwhile, I bring a quart or more of cider to a simmering boil, cool it covered, and when cool I add it to the (already working) gallon jug of starter. My theory is that this gets the yeast accustomed to the acid environment and characteristics of the cider before it is set loose at much lower concentration in the carboys, but again I don’t really know what I’m doing, other than that it works. At that point I usually have to go back to work, and my mom pitches the yeast sometime on Monday or Tuesday. She uses a sharpie to divide the liquid contents of the jug into roughly equal volumes, pours a measure into each carboy, and recaps with an airlock. That’s all there is to it – we’ve never taken pains to keep the carboys at a certain temperature, to aerate, or any other tricks. I think this will basically always work as long as the starter is actively working when you dump it in the carboy. After nine years, thanks to the accumulated contributions of ideas, time, and equipment-building effort, and especially to the wonderfully useful and flexible barn that my folks built, the cider operation is getting to where it runs in a well-worn groove. And it’s a good thing, since the great majority of my attention has been devoted to Pika Energy, and building affordable, high-quality home wind turbines. We started the festivities Friday evening with pot-luck Mexican at the shore cabin, followed by a black-powder demonstration (no bullets) by Jake, and revival of an old tradition, Viking Funeral Ships – in which small barges made of wood planks piled high with birch bark, pinecones, and kindling are set afloat after dark, and rocks are thrown from on shore at a sporting distance to smash them – if anybody has a photo of this, I’d love to post it. Thanks again to everyone who participated this year. Next year is the 10th anniversary – I don’t know what we’re going to do, but it’s going to be big!